Deadlines. It’s hard to think of anything more important to a construction project manager. Running over deadline doesn’t just mean unsatisfied customers, it also means potentially running over budget. Large construction projects cost millions of dollars per day. Simply meeting deadlines is a way to avoid these potential expenses. Drone surveying can help a company manage risk and improve operations in four very important ways. Drone surveying is faster and more effective than traditional ground surveying. Ground surveying requires that teams chart the area from land, while manned aerial surveys are expensive and aren’t able to fly low enough to get high-resolution imagery. If you want accurate, fast imaging, drone surveying is the best option. Drones are able to cover large amounts of land very quickly, regardless of how complex or hazardous that land is. Not only do they fly quickly, they also have fewer potential safety concerns; consequently, they can tackle terrain that would otherwise be very difficult to map. Many projects aren’t able to get off the ground at all until surveying is completed. If your surveys are delayed, your entire project will be delayed. Being able to complete surveys faster gives you a buffer for unexpected things that can occur later on in the process. When using advanced, high-resolution scanning, you’re more likely to catch details that could disrupt a project later on. Surveying is intended to give an organization all the information that it needs for a successful project from the start. The more accurate the data is, the less likely potential issues are to arise. Surveying your site with a drone allows you to penetrate to ground level even if the ground isn’t visible, giving it the advantages of ground surveying through an aerial surveying method. The costs of inaccurate surveying can be significant. In a worst case scenario, property boundaries could be improperly marked, ultimately leading to significant project alterations. For projects such as pipelines, a lack of accurate surveying could involve trespassing through environmental zones or traversing hazardous terrain. Ground surveying and manned aerial surveying both involve significant safety risks for personnel. Ground surveying teams must manually explore terrain, which means they could potentially get injured while trekking through hazardous areas. This is on top of the fact that ground surveying tends to be time-consuming and often inaccurate. Aerial surveying comes with even more substantial risks. That team is at constant risk of a crash, which could lead to serious injuries or fatalities. Multiple individuals are required to be aboard an aerial survey, to both pilot the vehicle and operate the equipment. Even if someone isn’t badly injured during a ground or aerial survey, it can still delay operations. Once an accident occurs, it has to be inspected. Physical equipment may be damaged, which can lead to the need for replacements and repairs. Though UAVs can still crash like any other aerial vehicle, they are much safer than either type of alternative hardware. If a UAV crashes, no one is injured. A new craft can be immediately deployed and the survey can be completed. Once you’ve completed a survey, the data is often used in a variety of ways. Subcontractors may require it to price out quotes and run simulations, while other third parties—such as clients and vendors—may want the data for their own purposes. In traditional setups, this site data would need to be exported into a readable format and then sent to the third parties and subcontractors, who’d then need to import and configure the data themselves. Traditional survey data can take a while to process, while drone survey data can be transmitted soon after the survey is completed. Modern drone setups can consolidate and analyze data through end-to-end processing, and once the data has been appropriately consolidated it can be forwarded in a complete, condensed format for stakeholders. This allows them to begin work faster. Drone hardware has extremely modern data setups, designed to capture complex, high-resolution data in a way that’s easily read by a number of different systems. Further, companies can process this data internally with the right software rather than sending it out for preprocessing. 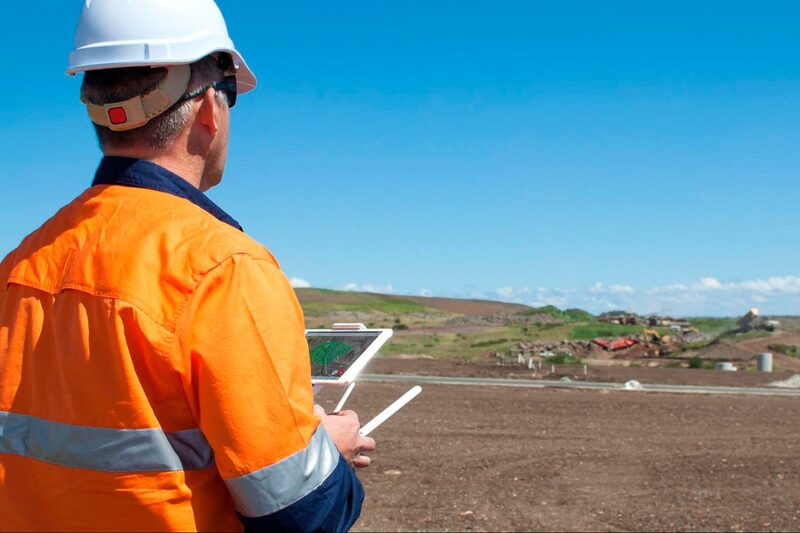 From data processing to safety, drone surveying can improve construction projects in myriad ways. Many improve the overall quality of the project, including meeting deadlines. Dustin Price is a licensed land surveyor and operations manager at Landpoint. He leads the company in determining the technical approach for delivering professional, tailored surveying services through UAV technology. Watch a demo of the Propeller Platform.